Ginger kids, old people, underpants gnomes and other general threats are invading South Park Colorado. It's up to Kenny, Stan, Kyle, Cartman and other South Park kids to keep the evil at bay with their snowballs, special abilities, and a variety of defensive towers. We gave this game a co-op whirl, curious to see if South Park: Let's Go Tower Defense Play! is worth an 800 purchase, or if it's best left in the snow. To me, tower defense games are generally too passive, almost boring to play. The primary goal is to set up towers in strategic locations along a set path to slow the advance of an enemy to protect a goal. If the goal is breached, the game is over. 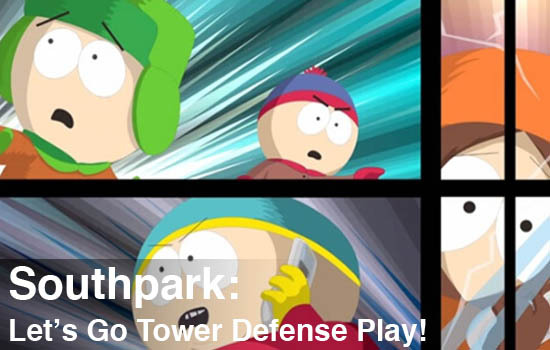 One way that South Park: Let's Go Tower Defense Play! takes an interesting approach to the traditional Tower Defense genre is with the amount of player action mixed in with the strategic tower defense gameplay. Each character can manually throw snowballs, aiding in the towers assault against wave after wave of varying styles of enemies. If you hold down your attack button, your snowball gets charged up for a more powerful attack - I won't tell you what they're made out of when charged though, it's a surprise. Having the ability to use your character for more than coin collecting or tower placement is great, and adds a definite flair to the game from the start. Tower Defense games rules still apply; you can't build solid walls to completely block movement of enemies or they will break everything down and go in a straight line toward the goal. You cannot touch the enemies with your character, that will knock your character out cold until someone can resurrect them or the wave is finished. Page created in 0.9515 seconds.